OVERVIEW A spacious and modern five bedroom detached property situated in a sought after village with excellent amenities. Yew Tree Close is a small cul-de-sac of nine properties on the edge of the village of Whitchurch. Built in the early 2000's on three floors the property offers spacious and versatile accommodation with views over the surrounding countryside with the convenience of being in walking distance of all the village amenities. ACCOMMODATION Reception Hall: Timber and glazed front door, wooden floor and stairs to first floor. Sitting Room: Bay window overlooking the front garden. Feature stone fireplace with rustic tiled hearth for an open fire. Study: French doors out onto the rear patio which take in the views. Cloakroom: Two piece white suite. Open Plan Dining Kitchen: Fabulous entertaining space with country style shaker kitchen cabinets with dark wood work-top. Kitchen dresser compliments the kitchen with plate, wine rack and display cabinets. The Central Island provides further storage and secondary sink unit. 'Rangemaster' range with 'Rangemaster' extractor hood over. There are windows to three sides overlooking the rear garden and French doors lead onto the patio and raised deck seating area. There is a further door giving access to the side of the property. Galleried Landing: Window overlooking the front garden and double doors give access to the airing cupboard, stairs to second floor. Master Bedroom: Lovely and light room with dual aspect windows to rear and side looking towards the views. Two fitted 'his and 'hers' wardrobes. En-suite: White suite with built-in shower unit with power shower and 'Mosaic' tiling. 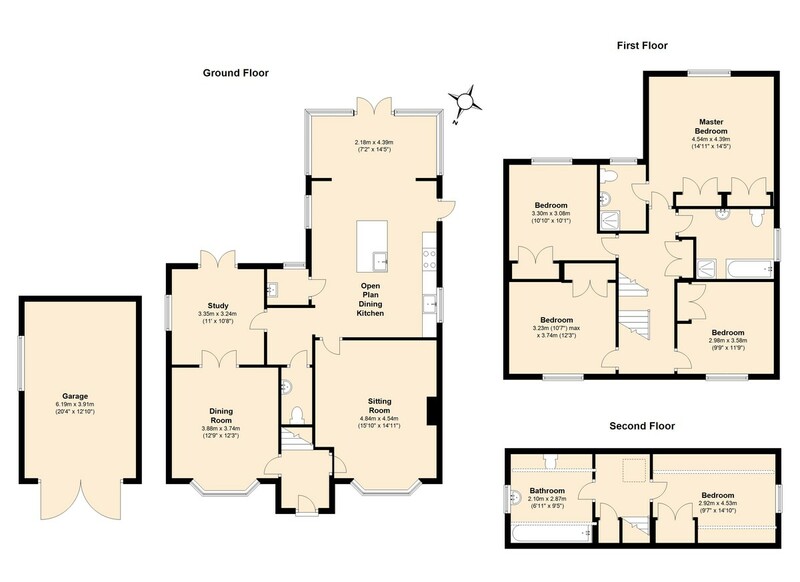 Three further double bedroom s on this floor all with built-in wardrobes. Bathroom: White three piece suite, white heated towel rail and mixer shower tap over bath and separate built-in shower. Landing: Velux window and door to built-in cupboard. Bathroom: White three piece suite, heated towel rail and mixer shower tap over the bath. EXTERIOR Block paved driveway leads to the single detached garage with side courtesy door, window and timber doors to front. Low level fencing bounds the front garden which is laid to lawn with central paved path to front door. The rear garden is predominantly laid to lawn with patio area and a feature raised decked seating area. Lovely views can be enjoyed from the rear and front of this property. LOCATION Whitchurch is a popular village sitting equidistance between Ross-on-Wye and Monmouth, which fringes the area of outstanding natural beauty of Symonds Yat, offering a number of leisure activities including mountain biking, canoeing, rock climbing, walking and a host of other outdoor pursuits. Whitchurch has an 'Ofsted' junior school, a superb village store with coffee shop, MOT Garage, Dentist, Public House and Hotel. Monmouth, home to the renowned Haberdashers' Schools, is 5 miles away which offers an array of individual shops and Ross-on-Wye is 6 miles, also offering a wide range of amenities and John Kyrle High School. DIRECTIONS From Ross-on-Wye follow the A40 towards Monmouth and take the exit at Whitchurch. Take the second exit at the mini roundabout and follow the road over the bridge, and at the staggered junction turn left towards Llangrove and Yew Tree close will be found on the left hand side a short distance after.